Coffee aficionados will love this exfoliating scrub! Coffee, sugar, vanilla hazelnut fragrance and other ingredients blend to create this softening and moisturizing scrub. This popular recipe is easy to make, and appeals to a large audience. You Save $10.90 by purchasing this kit rather than buying the items separately. "Very Easy to Make, Finished Product is Excellent"
COMMENTS: Very easy to make, the finished product is outstanding. Leaves my skin feeling soft and smooth! This has quickly become a favorite for myself and my customers! "Perfect Scrub ....Too Many Parabens"
COMMENTS: I thoroughly enjoyed this scrub, however I noticed it was full of Parabens. Do you happen to have a kit for Exfoliating Scrubs without so many Parabens? Overall, I enjoyed making this kit and the fragrance was perfect for this coffee scrub. Only concern I had was all the Parabens and how I wouldn't be able to offer it to health conscious clients. • Easy to follow instructions and video. "My Customers Love This One!" COMMENTS: This coffee and brown sugar scrub is EVERYTHING! It smells a decadent! Even for my non-coffee lovers this product makes the day alright! The texture and consistently is much to be desired. I tried it for myself and I instantly fell in love. I can't keep this stuff in stock. I will definitely be ordering more! COMMENTS: I made this kit yesterday. It smells incredible, and feels great on the skin. I'm going to order another kit for gifts, because I don't want to give this set away! The directions were easy to follow.I paid $10.00 for a no-name scrub at a local store. It doesn't compare to the cost, quality, or fragrance of this one! COMMENTS: My daughter and I made this last night and I'm impressed. It was super easy to put together. I tried it out today and it left my skin silky smooth...plus it smells yummy! I will definitely be adding this to my product line. "Can i make this without a preservative if i reduce the amount of bath whip in the mix and add more sugar?" Staff Answer A preservative is added because of possible water contamination if used in the bath or shower. Water will eventually cause the scrub to mold if a preservative is not used. "What size shrink wrap bands would be appropriate for this kit?" Staff Answer The shrink band recommended for this 8 oz. Clear Heavy Wall jars are the 155 x 55 shrink wrap band. "What I can add instead of foaming bath wip?" Staff Answer This recipe was designed with the Foaming Bath Whip and is the base for the scrub. There is no replacement for this product. 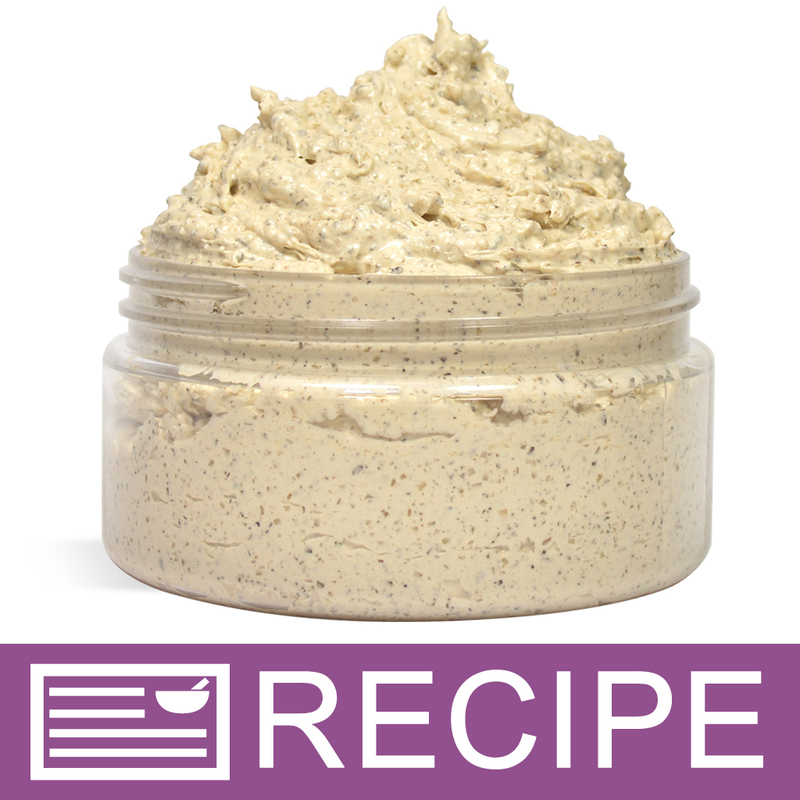 The recipe would need to be redesigned as an emulsified scrub (here is an example: http://www.wholesalesuppliesplus.com/education/recipes/Creamy-Vanilla-Fig-Emulsified-Sugar-Scrub.aspx). Or, if an emulsified scrub is not wanted, the brown sugar can be mixed with oils and butters and would need to be mixed together before each use. "What can I substitute the phenonip for in order to keep the product paraben-free?" Staff Answer Hi LaSaunia, Optiphen Plus is a paraben-free preservative. "How much Optiphen Plus can be used in this recipe? Thanks for making this easier by answering all the questions. They are all very helpful..."
Staff Answer Hi Natalie, Optiphen Plus has a max. usage of 1.5% which is 1.2 oz. for the whole 80 oz. recipe. Please keep in mind that we have not tested that substitution in this recipe. Sometimes Optiphen Plus can thin out products, which might change the consistency of the scrub. "Can this also be used as a face scrub or just a body scrub?" Staff Answer Yes, depending on the skin type. For sensitive skin the sugar and coffee ground granule size may be too abrasive for the face. "What oil can I use in place of Sweet Almond Oil, ! have a few customers with nut allergies?" Staff Answer Any oil of similar viscosity can be substituted for Sweet Almond Oil in a sugar scrub. I would recommend Avocado Oil or Olive Oil. Be sure to test all substitutions in a small batch first to ensure compatibility. "can I use Optiphen for this scrub?" Staff Answer Yes you can. Optiphen Plus is compatible with most raw materials making it ideal for this recipe. Just beware that it may cause your scrub to thin out some.